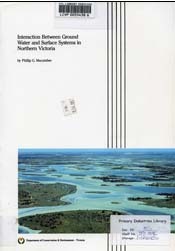 Interaction between Groundwater Surface Systems in Northern Victoria, published by the former Department of Conservation and Environment in November 1991, by Dr Phil Macumber is the culmination of 25 years' work on groundwater / surface water interactions in Victoria, written around the occurrence, character and movement of water and salt in the landscape. It is a landmark publication providing a technical basis for understanding the processes and trends occurring within the groundwater systems. While initially written as a PhD thesis, it has been subsequently expanded to incorporate more specific details on technical aspects of salinity control.